Bespoke Colours: Do you want your safety steps in a special colour? To order a bespoke RAL colour please call our sales team on 0800 0126777. The net price and delivery time might vary. Our Standard Series Mobile Safety Steps have been load tested in 2018 by a UK specialist lifting equipment company who are members of the Lifting Equipment Engineers Association (LEEA). They have been tested to a maximum static vertical load of 225kgs distributed evenly on the platform using calibrated test weights. Our Safety Steps are British made from all-welded steel construction. 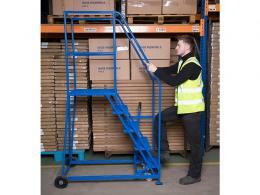 These mobile steps are a popular product for warehouses, industrial units, storage facilities and supermarkets stock rooms etc. They can also be used for cleaning including for aircraft and lorries. These portable steps available in a wide range of sizes and the treads or steps are available with punched steel or anti-slip rubber. 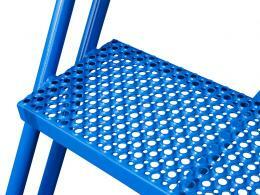 The kick plate meets government safety requirements for raised platforms. What is the purpose of the mobile safety steps? When elevated access is required for any kind of maintenance, repair or other purpose, it is recommended that mobile platform steps be used as secure alternatives to a conventional ladder. Access steps and platforms can provide an elevation of up to 3659mm, which equates to a working height of about 5159mm. 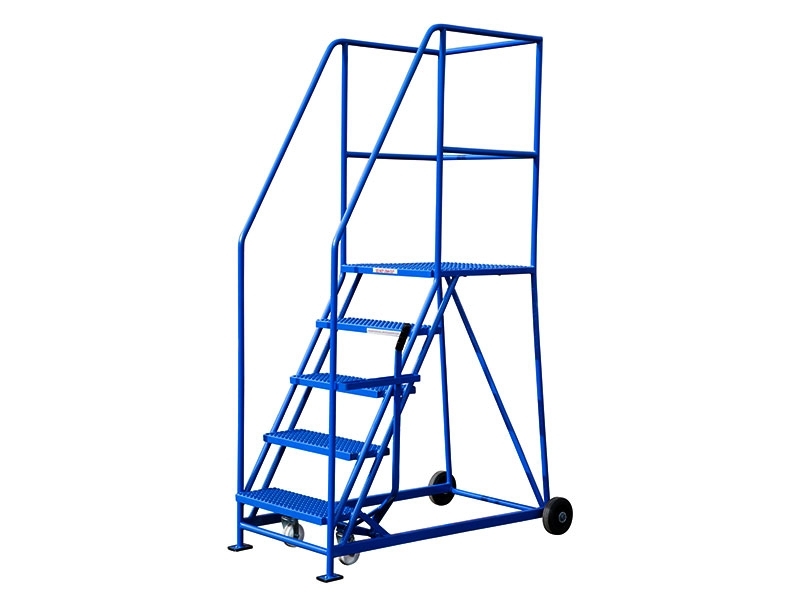 These steps on wheels are mobile and is built with a lever-controlled locking mechanism that provides stability while in use. For any job that requires employees to work at elevated heights this product provides a way to get the job done in the safest way possible. Where can the mobile safety steps be used? This product is ideal for any location where products are stores out of 'natural' reach. Various models are available, ranging from 5 steps to 16 – each providing the ideal elevation for various types of requirements. Primarily designed to facilitate safe elevation for maintenance work, this versatile product can be used in a number of settings – from warehouses to industrial sites to factories to hotels to libraries to any other location that requires such a product. The mobility of the unit makes it ideal to shift from one place to another, and the locking mechanism ensures that the unit does not move when someone is climbing it or working on it. This element of security presents an excellent working platform for the user. These steps can make an excellent alternative to performing jobs that step ladders may not quite reach. Tasks in large scale environments can be made easy with these platform steps, such as large warehouses, cleaning of lorries or buses. 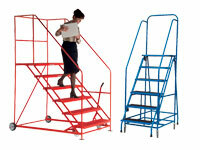 Safety Steps can make it easy for anyone to access platforms out of reach or too high for traditional folding ladders. Any safety supervisor working in any domain – be it industrial, commercial or private – will find this to be an essential tool to possess. It is ideal for maintenance staff, stockers, lighting technicians, and many other professionals. The robust design ensures safety of employees and, therefore, is a product that must be considered by health and safety officers in any organisation. This versatile product can be used by anyone who wants a safe way to climb up to an access point for any reason. The welded steel construction makes this a durable and safe product. Step options are available from 5 to 16 depending on the intended use and elevation requirement. The treads are available as punched metal or anti slip rubber for maximum traction while climbing. The top platform is barricaded for safety on three sides, and has kick-plates to prevent users from accidentally stepping off the platform. A hand-operated lever locks the mobile steps into position when required. This product has been rigorously tested for load-bearing capacity of up to 150kgs when weight is equally distributed on the treads and platform. It is manufactured in the UK and has a one-year parts and labour warranty.